The 48th Patrick Kavanagh Weekend and Poetry Awards took place in Inniskeen last weekend. It was a success and if we highlight one particular event it is not a reflection on others. Oliver Callan, President of the Patrick Kavanagh Society gave an exhilarating solo performance on Saturday night. A packed Kavanagh Centre was enthralled by his take off of all Ireland’s great and good; Marion Finucane, Mary Lou McDonnell, David Norris, Micheal O’Muircheartaigh, Leo Varadkar, Micheál Martin, Brendan Howlin, Enda Kenny were all accomplices in Oliver’s mischievous and wicked wit. He finished the evening with a take-off on President Michael D. Higgins which had the large audience in peals and pains of laughter. ‘Poetry and Journalism’ and outlined Kavanagh’s career in journalism and his quest for truth which Ms. Harris said is the true vocation of journalism. This was followed by Questions and Answers with Oliver Callan. Brian Lynch, the adjudicator of the Patrick Kavanagh Poetry Award then announced the winner. Conor Cleary from Tralee took the Award. He is presently living in Glasgow. Mark McNally, Grant Thornton International presented the prize. He told the audience that his firm was delighted to be sponsoring this prestigious award and he himself, a native of Carrickmacross, was happy to resume a connection with Patrick Kavanagh as his grandfather, John, knew the poet well. The evening ended with a sparkling performance from Cantemus Choir from Carrickmacross. They sang and harmonised music from the ages and they were joined on stage by Lorcan Murphy whose dancing skills, well known beforehand, sent the audience home foot tapping in their imaginations. 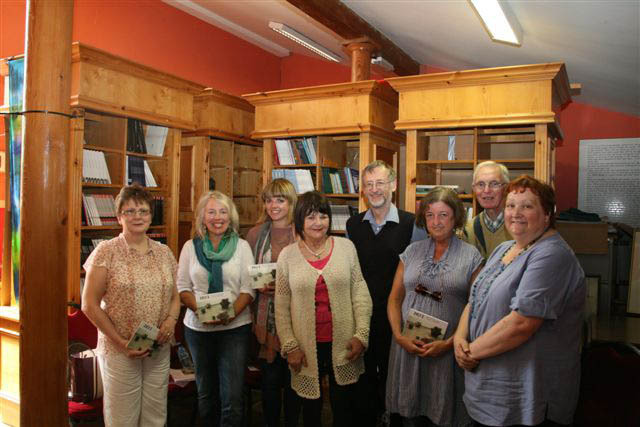 Larry McDermott brought his touring group through Carrickmacross in the footsteps of the poet on Saturday morning. Back in Inniskeen, Conor Cleary and runner-up Alyn Fenn both read from their winning collections. Caitriona Ni Chleirchin from Emyvale, an outstanding young Irish poet spoke of ‘Translating the Landscape’. She talked of Kavanagh’s influence on her, writing about his place. She felt the need to write in Irish about landscapes familiar to her. Caitriona is the poet who emotionally involved the audience at the 50th commemoration with Kavanagh’s Memory of my Mother and her Irish translation ‘Cuimhne mo Mhathair’. In the afternoon, Dr. Una Agnew introduced the speakers. Vonnie Banville Evans from Faythe in Wexford talked about the necessity to sit down and write. She said that what she might have considered of little consequence was met with positive responses from her readers. Fr. Martin Treanor,P.P., said the Commemorative Mass and Fr. Vincent O’Hara, ODC gave the homily. It was a privilege he said, to be in Inniskeen on this occasion. We went back to the Centre then and Oliver Callan entertained us royally. Sunday morning broke bright and clear and the coach trip headed off. First stop was the forge at Essexford where Sean Farrelly educated the audience on Patrick Kavanagh’s association with the forge at Essexford and particularly on Peter Connor’s incident with Kavanagh. Conor was the blacksmith there. Seamus Heaney’s forge poem ‘A door into the Dark’ and Longfellow’s poem ‘The Village Blacksmith’ were read by Vincent Coyle and Brian Lynch. We visited the home at Mucker and we then went to Drumcatton. Here Brian Dooley regaled the group with some incidents from ‘The Green Fool’ and other anecdotes. The next stop was Donaghmoyne graveyard where both the poet Cathal Bui Mac Giolla Gunna and William Stuart Trench are buried. Larry McDermott talked about Trench who was an unpopular landlord and about whom Kavanagh has written some verse. In Mannan Golf Club Lorraine Cotter sang two famous songs; Cathal Bui’s ‘An Bonnan Bui’ and Art Mac Chumhaigh ‘Ur Chill an Chreagain’. On the trip home we stopped at Shancoduff where Ethan from Castleblayney gave a dramatic recitation of the poem. At 2.30pm the graveside commemoration took place. Kane Kavanagh-Baer laid the wreath and Paddy Martin played the pipes followed by a minute’s silence. Peter Murphy and Brian Dooley organised the readers who included Dr. Una Agnew, Fr. Vincent O’Hara, Rosaleen Kearney, Anne Doyle, Thomas Ruddy, and Francis Meehan. In the Centre, Larry McDermott introduced Anne Doyle, late of RTE and one of Ireland’s best known news readers told the audience of her lifelong love for Kavanagh having learned ‘Apple Ripe September Morn’, her first poem in Secondary School. Then all was ready for the announcement of the Schools Poetry Awards. This year the sponsors were Nancy J. O’Keefe Rostkowski and Tom E. Moran-Rostkowski, relatives of the poet. The Awards were presented by Peter Murphy. Scoil Cholmcille, Blackstaff: 1st Adam King, 2ND Sarah Garnett, 3rd Shauna Kindlon. Second Level Schools – Junior Section: 1ST Oisin McDonnell, Colaiste Mhuire, Roscommon.2nd Place Rory Coleman, Scoil Mhuire, Buncrana, 3rd Brooke McCauley, Colaiste Ailig,Lettrerkenny. Second Level – Senior Section: 1ST Naoise Luby, St. David’s Holy Faith, Greystyones. 2nd Cian McGrath, Mercy, Mounthawk, Tralee, 3rdJoseph Ward, St. Conleth’s Community College, Newbridge. The Patrick Kavanagh Centre takes this opportunity to thank all those who gave so much of their time without stint. Chair of the Centre, Art Agnew, Rosaleen Kearney, Daig Qunn, Elmar Marron, Margaret Lynch, Alex Caretajer, Paddy Dowdall, Gabrielle Tuomey, Christina Watters, Joe Callan, and Claire Cunningham, Breda McGuigan and Briege Byrne and all those mentioned previously. A special thanks to the Clogher Historical Society for the use of their audio equipment at the graveside commemoration.